Cass Clayton Band has become known across the region for its tight chemistry and high-energy stage presence, a reputation that has landed them on some of the best stages, shows, festivals and radio shows in Colorado and beyond. Their unique blend of rock, R&B, funk, blues and soul has a distinctly contemporary feel, and has won over audiences across age groups and genres. 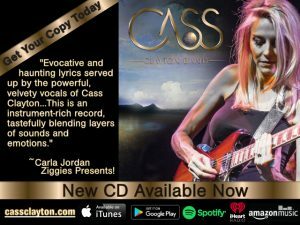 Cass’s new album (released June, 2018) has won 4 songwriting awards and garnered top reviews from magazines nationally and internationally. They were also recently voted Album of the Year 2018 in the Colorado Blues Society Members’ Choice Awards. In addition, Cass has been voted as one of the top 3 slide guitar players in Colorado and top 2 vocalists (CO Blues Society Members’ Choice Awards). 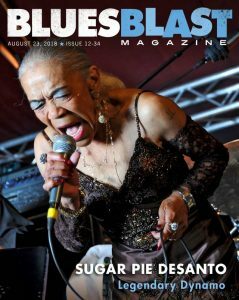 In February, 2019, she was featured on the cover of RECORDING Magazine with a 4-page feature article. Known for a uniquely soulful and velvety vocal style, Cass effortlessly moves from gentle and contemplative to a belting range that will knock you flat. The Band includes some of Colorado’s favorite seasoned musicians: Loren Phillips (bass, bkg vocals), Dann Burke (lead guitar, bkg vocals), Steve Saviano (drums), and John Stilwagen (keys, bkg vocals). Internationally touring musician, Taylor Scott, is a regular guest musician producer, and co-writer for the band. In 2019, Cass Clayton Band is already looking forward to an exciting year. The band is headlining for numerous festivals with more being added almost every week, including main stage at the Brighton Blues Blast, Denver Arts Festival (50,000 attending), Art Night Out in Lafayette, Stargazers Theatre Summer Series in Colorado Springs, and co-headlining Dickens Opera House with Grammy nominated, Brigitte Purdy. Past shows have included festival appearances and shows with Cyril Neville, Tab Benoit, Tommy Castro and the Pain Killers, and The Fabulous Thunderbirds. In addition, Cass is working diligently in the studio on another all-original album slated for release in August, 2019. Cass Clayton Band Chas become known across the region for its tight chemistry and high-energy stage presence, a reputation that has landed them on some of the best stages, shows, festivals and radio shows in Colorado. Their unique blend of rock, R&B, funk, blues and soul has a distinctly contemporary feel, and has won over audiences across age groups and genres. Their new album was voted Album of the Year 2018, Colorado Blues Society Members’ Choice Awards, and they will release yet another new-school soul album with 10 new songs in August, 2019. CCB is a 5-piece band that often features guest musicians. 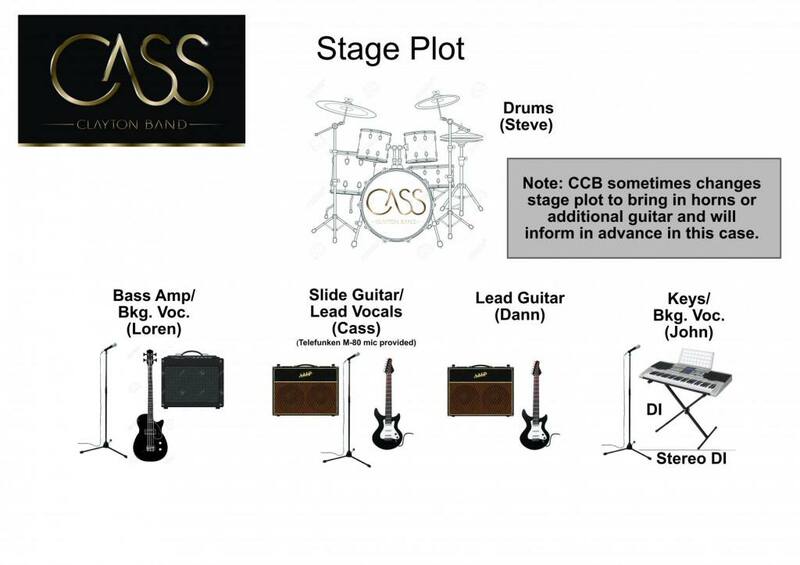 Depending on the stage, they may bring a featured guitar player in addition to rhythm guitar or add a horn section. Regular lead guitar players include Dann Burke and Taylor Scott. Cass Clayton plays slide guitar and is lead vocalist. Loren Phillips, one of Colorado’s premiere bass players, holds down the groove, sings background vocals and acts as music director for the band. Steve Saviano, a top session and band drummer, has been with the band since its inception. John Stilwagen of Colorado Springs plays keys and Hammond organ. CCB likes to keep it fresh and change the music up regularly, both for listeners and for their own joy! For more information about CCB, click here. 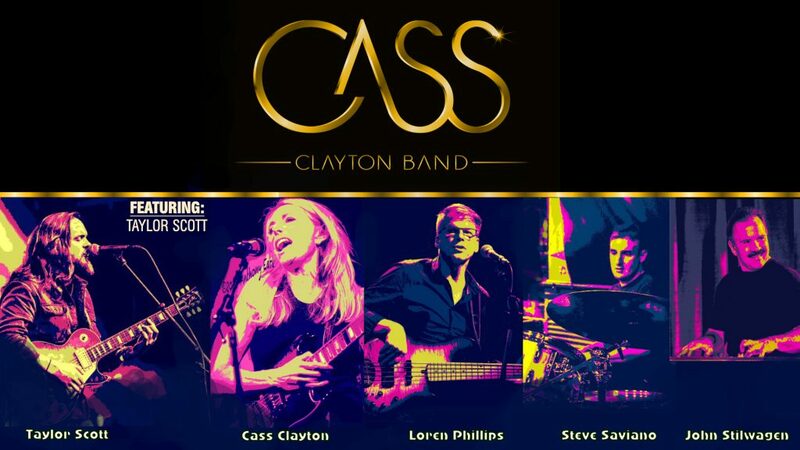 The Cass Clayton Band album was released in June of 2018, and is now available in the Store, on Itunes, Spotify, iHeartRadio, and Amazon Music, as well as other outlets. Media contacts can access music and the album One-Sheet at this Dropbox link. Another NEW ALBUM is coming in 2019 – Cass is currently writing new material and recording at Far & Away Studios with Master Engineer, Geoff Gray and Producer, Taylor Scott. With the success of the last album, the band wanted to keep their audience excited and give them more fresh music. Stay tuned for a June/July 2019 release! Cass was featured on the Feb. 2019, cover of RECORDING Magazine with a 4-page article about her most recent album, unique techniques for recording vocals and her work with producer, Taylor Scott, and Master Engineer, Geoff Gray. Magazine Editor, Mike Metlay, says “I fell in love with the album after just one listen…a petite lady with a smoky-sweet voice that sounds like it should be coming from someone twice her size.” To read the full article, please Click Here. 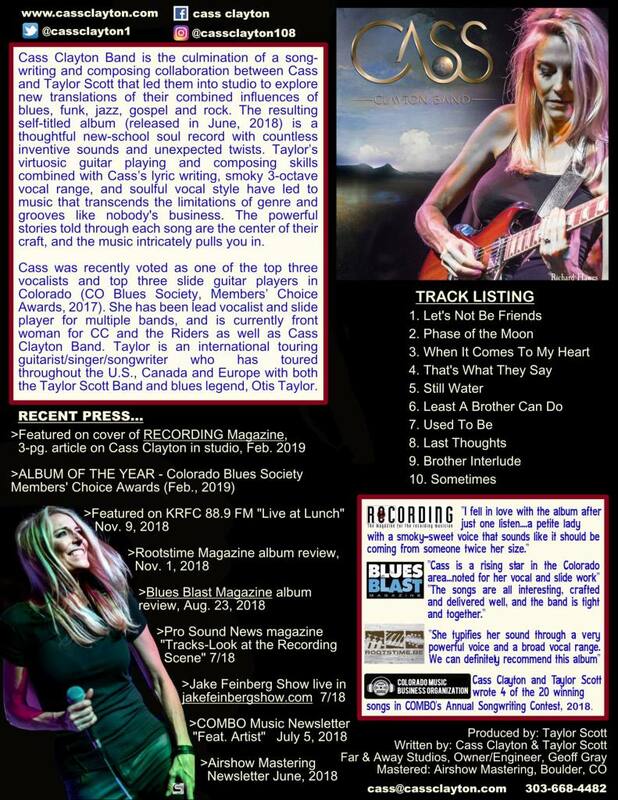 Blues Blast Magazine, August 2018 — Cass Clayton is a rising star in the Colorado area and is noted for her vocal and slide guitar work. Here she stays off the guitar and instead features collaborator Taylor Scott on guitar as they blend rock, blues, funk, jazz and gospel. The album tends toward rock and funk and features all original tunes. The stories told are interesting, mostly dark and delivered with lots of feeling. November of 2018, Cass Clayton and co-writer/producer, Taylor Scott, were among the top scoring songwriters in the COMBO (Colorado Music Business Organization) Annual Songwriting Competition. Four songs from the new album were in the top scoring entries. Each year judges select 20 top songs, 18 of which are featured in a compilation CD. The judges don’t know the name of the song, who wrote it or who performed it. They judge only on lyrics and melody, not production quality. So to have 4 songs from the new album selected for the mix is an exciting honor. Radio, media and festival/venue managers may click heading above for full album – MP3’s or WAV files on Dropbox. Full press kit (photos, music, plots, etc., available HERE. Photos also available in Dropbox.